Changes in their environment, such as fresh food trucks, walking groups, screenings, and cooking demos, helped Boston residents eat better and get more exercise. The Fresh Truck, a mobile market, arrives at a Boston housing lot. It brings fruits and vegetables to make nutritious diets more convenient. The one-year study looked at the diets and physical activity of people living in 10 public housing developments in Boston. After healthy options, such as walking groups and regular stops by a fresh fruit and vegetable truck, were introduced, a significant number of residents improved their eating habits and became more physically active. And they lost weight. Findings from the Healthy Families study were published July 16 in BMC Public Health. The researchers worked with local residents to make changes in the environment in which they and their neighbors carry out their lives. A neighborhood in Boston, the city where the Healthy Families study took place. Such an approach takes into account the social and physical influences on behaviors that can lead to obesity. The study’s multi-level interventions included lay health advisors, monthly health screenings for blood pressure and diabetes risk,easy access to healthful food, weekly walking groups, cooking demonstrations and printed resource maps. “We did not put an activity in place that could not be self-sustaining,” Bowen said. 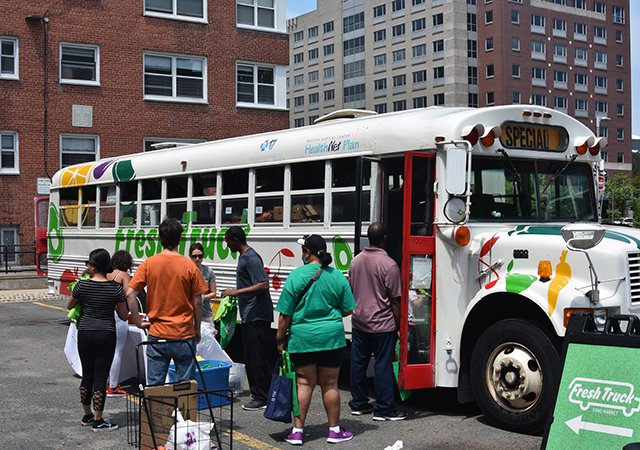 For example, to provide regular access to healthy food, the project team helped a group of Bostonians purchase an old school bus that they renovated into a mobile market for residents of public housing. “We did not want to walk out of the public housing developments after this study and just say, ‘goodbye and good luck, ’” Bowen explained. In this cluster randomized controlled trial, five public housing developments were assigned to the intervention group and the other five to the control group. The intervention group had access to all activities. Project staff surveyed adult female residents (who were more likely to be the heads of households) and their daughters, aged 8-15 years, at the start of the study and after one year. They also measured each participant’s height and weight during both visits. Researchers assessed three dietary behaviors: fruit and vegetable consumption, drinking soda, and mindless eating, such as having dinner while watching television. The researchers also assessed physical activity in the form of walking for leisure, transportation or exercise. Residents in the intervention group ate on average 1.6 more fresh fruits and vegetables a day. They also drank 6 percent less soda and ate 15 percent less fast food every week. What’s more, they were walking nearly 11 minutes more every day. On average, those in the intervention group reduced their body weight, calculated as Body Mass Index or BMI, by 1.5 points. Residents in the control group increased their BMI by 0.2 points on average. “It tells us that, in a relatively short time, we can turn unhealthy behaviors around in this really tough population if we had the will,” said Bowen, who was lead investigator of Boston University’s Partners in Health and Housing Prevention Research Center at the time of the study. “In residents who were literally 78 percent sedentary, we can change those rates and sustain them for a year.” After the intervention, the percentage of folks who were inactive decreased by 30 percent. The study authors had planned to focus on the mothers for the first year and their daughters in the second year. However, due to funding cuts, the project stopped after one year. At the UW School of Public Health, Bowen is working with Shirley A.A. Beresford and Jessica Jones-Smith to prepare a pilot research project in Washington state that will build upon the findings of the Healthy Families study. Beresford is a professor of epidemiology and adjunct professor of health services and Jones-Smith is an associate professor of health services and epidemiology. Co-authors of the Healthy Families study are Lisa Quintiliani, Sarah Gees Bhosrekar and Eugenia Smith, all from Boston University, and Rachel Goodman from the Boston Housing Authority. The Centers for Disease Control Prevention Research Center grant number for this study was CDCU48DP001922.